or weekly at $157.00 DEMO MODEL DRIVE AWAY FOR JUST $37,990! *Finance based on 208 weekly payments, monthly maintenance fee of $5, 30% deposit, interest rate of 9.5% fixed for the term of the loan. Includes an establishment fee of $380. Total repayments equal $36,143.44. Other variations and options may be available on application. Finance Company Lending Criteria Apply. For more details visit the Finance page of our website. 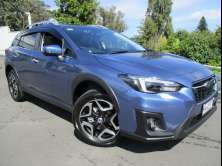 DEMO Subaru XV 2.0I Premium AWD - $37,990 Drive Away! SAVING $4,145! View the incredible ALL NEW Subaru XV 2.0I Premium AWD in our showroom today. Please contact our friendly sales team for full detailed specifications, accessory price list a finance/lease quote or trade in estimate. Brand New models available in a range of colours. View our testimonials on our website or follow us on facebook and see what our customers have to say! Morrell Motors is one of Taupo’s longest standing automotive Dealerships, operating since 1983. Come and experience the difference of buying a NEW Subaru from our trusted team.